HIGH A musical montage that perfectly captures the mood of characters preparing for an inevitable battle. LOW The conclusion of Michonne’s missing daughters fails to deliver and ends the episode on a down note. The Walking Dead: Michonne trilogy finishes stronger than it starts with What We Deserve. If the previous two episodes were the narrative equivalent of having to place dominoes one after another into an elaborate but momentarily obscured design, What We Deserve feels like flicking the first domino and enjoying the chain reaction that follows. As if acknowledging that episode one did not do enough to endear players to Michonne’s crewmates, this chapter opens with a flashback that establishes the familial bond on the ship that acted as her temporary home. 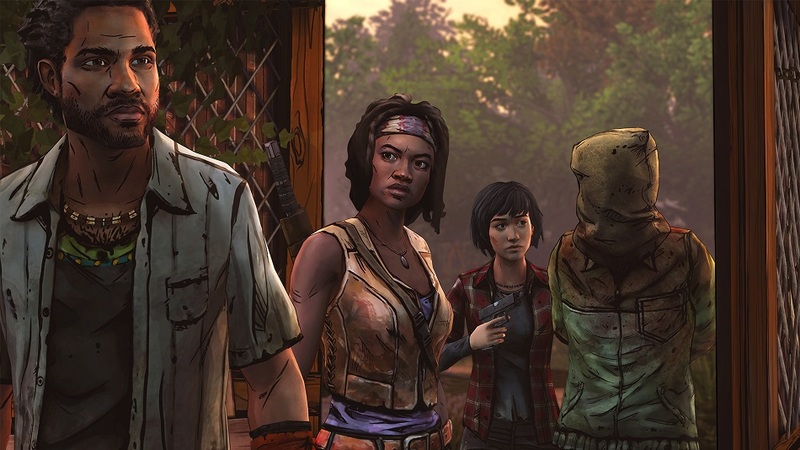 Here an intimate conversation between Michonne and a crewmate invests players in the lives of these relatively-unknown NPCs and helps set the stakes for what follows. The Michonne series continually weighs the value of human life compared to the drive to survive, and the earlier episodes succumb to more nihilistic tendencies. The opening flashback here wants to remind players that there are still reasons to care about other people. The rest of the episode involves Norma storming Sam’s gated compound in an attempt to retrieve her brother Randall. How players navigate this precarious situation has a lot to do with key choices from episode two, and whether players believe in standing their ground against near-impossible odds or whether running is a more sensible option. Players explore their own feelings about the issue by talking with the other survivors at Sam’s house. It is through these conversations that the episode rehearses themes familiar to the Walking Dead franchise like loyalty, faith, regret, revenge, corrupted innocence, and the nature of evil. For instance, players have the chance to teach Sam’s little brother James how to handle a firearm. This interaction echoes the loss of innocence that the series has been investigating since Clementine cut her hair and learned to fire a gun in the first season of The Walking Dead. Intercut throughout the episode is Michonne’s continual battle with PTSD from the loss of her daughters. Although it’s an intriguing bit of backstory, the time devoted to this subplot ultimately feels wasted since the great revelation these flashbacks promised is never delivered. One of the last choices players make is tied to Michonne’s sense of guilt, but it feels so awkwardly executed and ill-timed that it ruins the catharsis it’s supposed to represent. Like the rest of the trilogy, What We Deserve feels like well-trodden territory for this series of games, and despite introducing the psychology of a mother dealing with grief and regret, this trilogy has never really found its own voice. More frustratingly, it doesn’t provide a satisfying answer to the mystery of Michonne’s missing daughters. If anything, the conclusion of that sub-plot feels anti-climactic rather than revelatory. This episode is stronger than the previous two, but it can’t support the trilogy by itself. Disclosures: This game was obtained via publisher and reviewed on the PC. Approximately 1.5 hours of play was devoted to single-player modes (completed 1 time). There are no multiplayer modes. Parents: According to the ESRB, this game contains: intense violence, blood and gore, sexual themes, and strong language. This episode features gunshot wounds to the head and body, the hacking off of limbs, copious amounts of blood, and other instances of physical violence. Deaf & Hard of Hearing: Subtitles and onscreen button prompts mean that players can enjoy the narrative game without sound. John Vanderhoef is a writer, editor, and academic. Other than game reviews, he mostly writes about the culture and industry of video games. He loves narrative games and is an MCU fanatic.